Located in the heart of the Oak Knoll District, where the valley’s earliest vineyards were planted in the 1800s, Trefethen Family Vineyards is a family-owned estate winery. The family is passionate about crafting world-class wines that truly reflect their origins in the vineyard. The cool climate in their location, coupled with a thoughtful approach to farming and winemaking, results in acclaimed wines known for a brightness on the palate. Their historic wooden winery building, built in 1886, stands sentinel over the beautiful vineyards that provide all the fruit for their estate-grown wines. This landmark building was severely damaged in the 2014 South Napa earthquake. The family completed a full restoration and opened their historic landmark again in May of 2017. Please note: At this time we are unable to accommodate anyone under the age of 21, including infants and children. Reservations are required for groups of 6 or more. One of Napa’s classic wine estates, Trefethen is still a hidden gem. Easy to find, but only if you’re looking, our entry is on Oak Knoll Avenue, tucked away from the crowds of Highway 29. The driveway John Trefethen used to land his plane on runs through the middle of our vineyard, over the ground we have tended for over 45 years. For the first time in our history, the Trefethen family is welcoming winery guests into the residence of founders, Gene and Katie Trefethen. Antique gates give way to quaint and private garden pathways leading to the grand Craftsman style manor – The Villa. Filled with stunning woodwork from the early 1900s, the Villa is surrounded by Katie’s treasured private gardens and offers a variety of tasting experiences in the salon, sunroom and deck. Guests are welcomed by appointment until the restoration of our beloved Historic Winery building is complete in early 2017. Trefethen welcomes guests by appointment. View from Tasting Room: Sweeping vineyard views welcome guests to Villa Trefethen - located in the heart of our beloved gardens. To join the wine club, visit www.trefethen.com or call 707-255-7700. Become a member of the Trefethen family by joining one or more of our wine clubs. Club Trefethen, Grateful Red and our HāLo Circle members are our VIP customers with preferred access to new releases, limited-production wines, member's only events and concierge services. Members receive a complimentary tour of the winery with prior arrangement and/or complimentary tastings for up to four guests of any four wines from our daily tasting menu. (Seated tastings are available for an additional fee) HāLo Circle members receive our most rare and coveted wines, vertical collections, and have first crack at limited-attendance events. 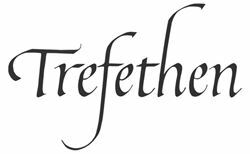 Trefethen Family Vineyards is certified under the Napa Green Winery Program by the Napa County Department of Environmental Management (DEM) and the Association of Bay Area Government’s (ABAG) Green Business Program and completed all the regulatory components needed for environmental sustainability. These components included developing water and energy conservation methods, preventing pollution, and reducing solid waste. In addition to developing sustainable winery practices, this program is set to become the standard for the state of California. Trefethen Family Vineyards is certified under the Napa Green Certified Land Program. Trefethen Family Vineyards has created and implemented a customized farm plan with measured results that addressed all aspects of its property, vineyard land as well as non-farmed land, including practicing soil conservation, water conservation, stable drainage, riparian corridor enhancement, fisheries and wildlife habitat enhancement and long-term improvement and sustainability.